MOSUL -- We witnessed first-hand just how vicious a street battle the fight for western Mosul has become. Heavy gunfire and explosions rang out from every direction. It was hard to know where to take cover. Iraqi soldiers dashed across the street, dodging fire from an ISIS sniper. A mortar exploded behind us. This is what the fight to recapture the Old City of Iraq's second-largest metropolis has become and, right now, it's clear ISIS still has the upper hand. Iraqi forces' armored vehicles can't get through the labyrinth of alleyways and narrow side streets, so soldiers have to fight this battle on foot. ISIS has held these neighborhoods for more than two years. They know the pinch points and blind spots. Their snipers have taken up positions in the taller buildings, and they take aim at anyone who approaches. For six months, Iraqi forces have fought to reclaim Mosul, starting with the eastern side of the city which was declared liberated in January. The U.S. and coalition airstrikes that helped Iraqi forces push through the outlying areas of Mosul to get to this point are much more difficult to target in the congested neighborhoods that ISIS still holds. As many as 650,000 civilians are still trapped in these areas. We watched as heavy artillery, some of it fired by the roughly 5,000 American forces here in support of the Iraqis, soared toward ISIS targets. Attack helicopters fired missiles and heavy machineguns. But those weapons, too, have their limitations in built-up areas. It is such close-quarters combat that a simple wrong turn can leave Iraqi forces incredibly vulnerable. On Monday an Iraqi police colonel and eight of his officers were kidnapped by ISIS militants just 30 yards from their unit. An Iraqi Interior Ministry official said Tuesday the kidnapped police had run out of ammunition during a firefight with the militants. The Old City is a stronghold within a stronghold for ISIS. It is home to the al Nuri mosque, where ISIS leader Abu Bakr al Baghdadi declared the creation of his so-called caliphate two years ago. Recapturing the mosque represents a symbolic and strategic victory for Iraqi forces, and although it may now be less than 500 yards away from the front line, the offensive has now slowed to a crawl. 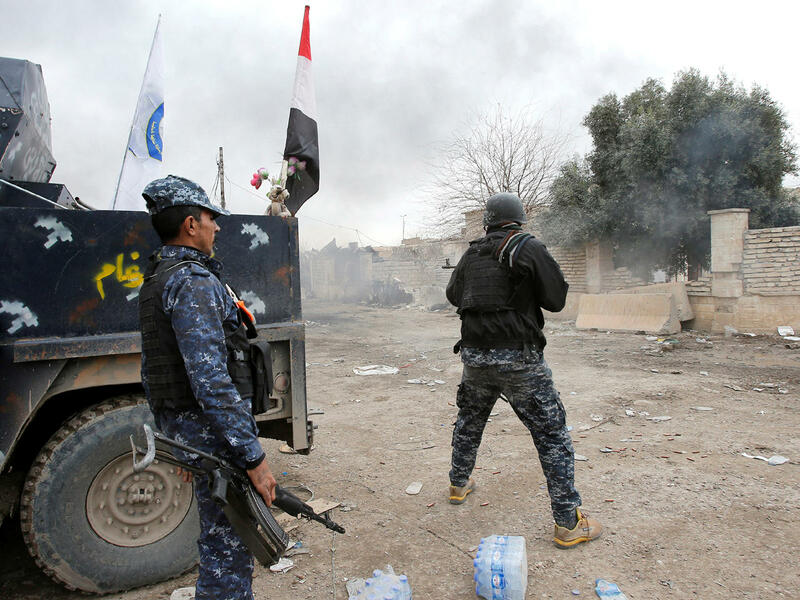 The Iraqi forces are essentially in a standoff with ISIS militants. Speaking to CBS News this week, Iraqi Prime Minister Haider al-Abadi said he believed the battle for Mosul would be over within a matter of weeks, and at that point, he said many of the U.S. troops in the country would be able to leave. But on the ground in western Mosul, it's clear ISIS is still determined to hold onto their last bastion in Iraq with everything they've got, for as long as they can.